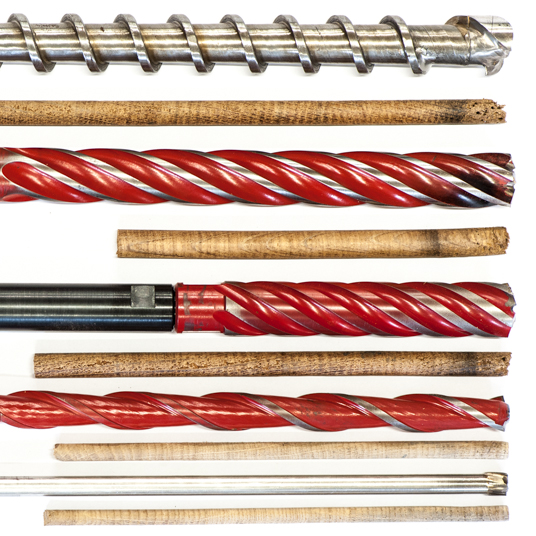 To be able to get the samples needed for dendrochronological dating, laboratories and building researchers use custom made borers especially developed for this purpose. Depending on the manufacturer, these borers have an outer diameter of about 20 mm and offer sample diameters of about 10 mm. They are made very tough and, therefore, are best suitable for dry timbers of deciduous wood. If needed, borers with an outer diameter of 12 mm can be used delivering samples of 6 mm in diameter. Using these borers can be reasonable if it is necessary to apply the least possible visible damage to the object under investigation. On the other hand, preparing cores from this type of borer for the analysis needs more elaborate work. Increment borers aren’t suitable for this kind of sampling for they may only be used for sampling living trees. Wooden pegs are available if it should be necessary to cover the boreholes. The choice of places suitable for sampling is limited. The user has to take care that there is wane available on the timber under investigation and that it is preserved on samples after sampling as well. This applies especially for coniferous woods. In case of spruce and fir sapwood cannot be optically determined leading to the problem that dating exactly to the year the tree was cut is not possible if the wane hasn’t been preserved on the sample. Even in case of coniferous woods having optically determinable sapwood (e.g. pine), wane should be preserved if possible, for these trees show a big splay in the amount of possible sapwood rings. If the sapwood is highly deteriorated using the method of sapwood stabilization may help. For more information, please browse to the chapter on the preservation of sapwood. 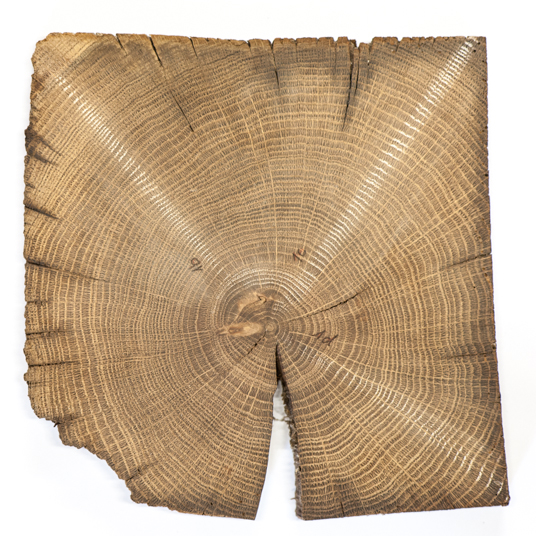 If customers send us slices or whole tree discs to be analized dendrochronologically this causes extra efforts during preparation and, therefore, leads to higher expenses as well. On one hand tree discs are the best samples available for dendrochronology because the dendrochronologist may analyze several radii on one sample. On the other hand it is not quite likely that the customer will get the opportunity to take such samples from an existing building. One of these scarce opportunities can be maintenance repairs. But the timbers for sampling must be chosen very carefully for carpenters often only cut the most deteriorated parts of the timber leading to serious problems during the analysis of this "waste". Furthermore, carpenters often only cut those parts of the timber the dendrochronologist would not choose for the analysis. Whole disc of a beam from the pediment of a building. Three radii have been analyzed to build the arithmetic average in order to improve the chance for a safe dating. In case of samples from archaeological context, most of the samples sent to us are whole discs for it is much more difficult to get a core from this kind of material. A core can only be taken if the material isn’t too much deteriorated. Furthermore, it is vital to keep up the moist content of archaeological samples. These samples almost generally break and alter their shape during desiccation making the analysis often very complicated and sometimes even impossible. a core can be taken. This is the case e.g. with furniture, panel paintings and sculptures. But, if the object fits some essential conditions, dating attempts may be possible with only very little abrasion. Therefore, dendrochronologically promising parts have to be chosen. These parts are often concealed and always of minor importance for the object under investigation. 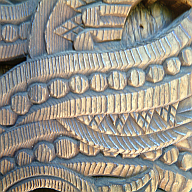 After being grinded and polished carefully, a photo or a scan can be made and then analyzed. Furthermore, the polished surfaces can also be analyzed using only a linen tester. But this might lead to the problem that measurements at a later point of time will often be only possible with higher efforts or even impossible. Musical instruments can be analyzed using this method as well. In case of violins the top plate is analyzed. Working with such delicate material generally causes a higher amount of work and, therefore, higher costs as well. In case of samples showing a very dense sequence of annual rings a single photo may not be adequate for the analysis, even when using a high definition camera. If this happens, a so called “gigapixel”-photography has to be made with the aid of a special device which can be used at the lab or on site as well. This kind of photo is made of a sequence of high definition photos which are stitched together afterwards, leading to a very sharp and detailed picture of the sample suitable for the analysis. Device for taking a series of macro shots. To improve contrast, the surface of the object under investigation is treated with chalk. 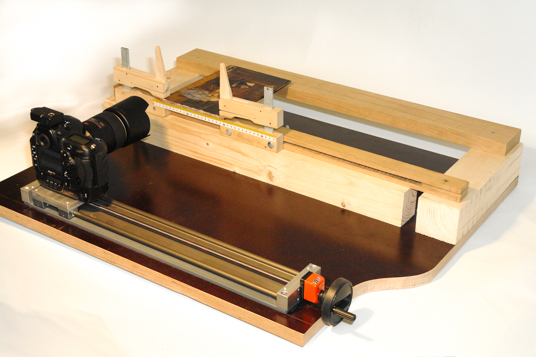 The device is equipped with a scale permitting to alter the picture area very precisely by steps of 1/10 mm. Every single picture covers an area of 35 mm (1:1). The stitched picture can easily be of 500 mm in length or even more. Only the mounting of the device limits the maximum size of the analyzed object. Objects up to a certain size can also be analyzed with non-destructive methods causing absolutely no abrasion to it. This method applies best for precious art work, picture frames, (parts of) furniture or sculptures. The radii needed for dating are made virtually by computer tomography (CT). Only modern tomographs are suitable for this method for they have a higher resolution. At least 5-6 samples with 60-70 annual rings each are needed by default per object under investigation/constructional phase to be able to provide our customers with safe datings. If the samples from the object under investigation do not fit these minimum requirements, at least a higher amount of samples is needed. Samples showing rather long sequences of annual rings (100-120) may allow a safe dating with less than 5-6 samples. Remember: The more samples and the better the sample quality the merrier and the safer the dendrochronological dating can be. If the sample material does not meet the minimum requirements, a higher risk for a false dating has to be envisaged. The customer is responsible for the sample material sent to us for the analysis!